he preferred to die with his boss Muhammadu Buhari if need be. Idiagbon returned to Nigeria willingly and surrendered himself to the IMF regime of IBB. 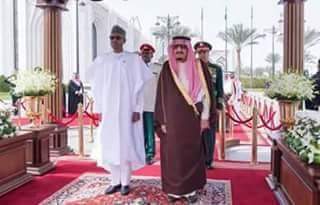 TODAY, 31 years after that unholy interruption of decency, here is Buhari in the Kingdom of Saudi Arabia receiving the most royally banquet treatment of all times. Foreign Doctors are also giving IBB similar treatments worldwide. One is not surprised that Saudi has decided to join Nigeria to bring dignity back to oil prices.....They love Buhari, they love Idiagbon. We also join in dedicating this post to Tunde Idiagbon, loyal, bold and daring deputy of Muhammadu Buhari during the period when IMF and World Bank launched imperialistic war on our economy. Rest in peace Tunde.....Buhari continues with the job again, where both of you left it and Osinbajo is doing it the way you have always wanted it done.